Easy- Groomed walking surfaces (gravel/pavement) primarily and minimal hills. Easy – Walkng surfaces may be ungroomed trails, or include some up and down- stairways possible. Medium – some level of fitness required. Uneven ground, ups and downs and/or longer distances. More difficult – good fitness levels required. Rough trails, or walking on natural rock outcrops, slippery sections, lots of up and down. Most difficult – Very good fitness levels required. Possible long steep hills, long staircases, rock scrambling, rough trails, slippery slopes! Got a Vancouver Island favourite place you want to share? We’d like to help! If you’re a Facebook person, please share your photos/videos/posts on Living Forest Oceanside Campground & RV’s Facebook page where they’re welcome (I’ll see it! ), or you can email me map@livingforest.com . Life’s too short to waste – visit the Island’s best places! Save this maplink and please share with others who might be visiting the Island or are Islanders and might want to share their own ‘best places’. This is a guide only! There are potential hazards everywhere you go and you must decide for yourself if a place is right for your fitness level to explore. These designations are strictly meant to help you decide if you want to visit a place. You are naturally responsible for your own safety and to know your own limitations when traveling. I make no representations to the accuracy of these designations, they are the subjective opinions of the people posting. Now that the ‘I’m not responsible for your safety’ part is out of the way- happy exploring of this magnificent and wild Vancouver Island and it’s Best Places! 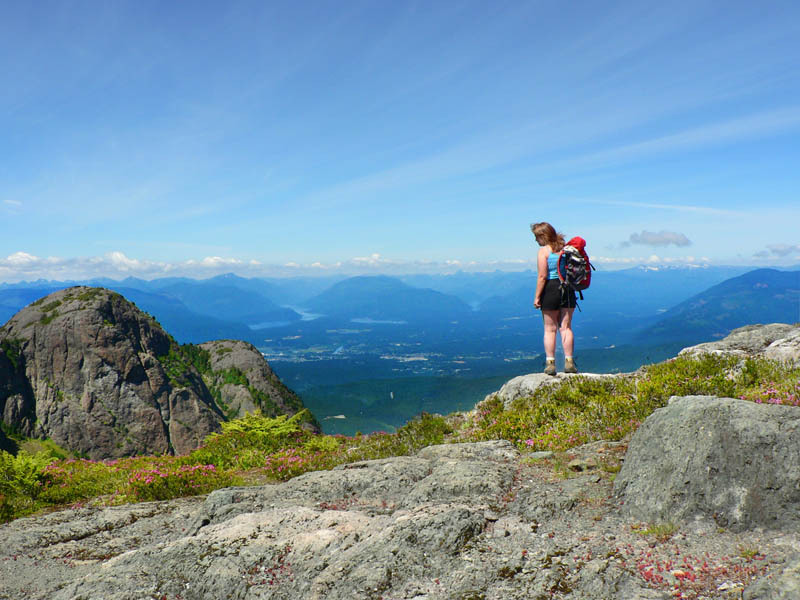 If you’ve spent any time driving around the Central Vancouver Island area, you’ve seen Mt. Arrowsmith looming on the horizon in any area north of Nanaimo. You can see it even if you’re in Campbell River. 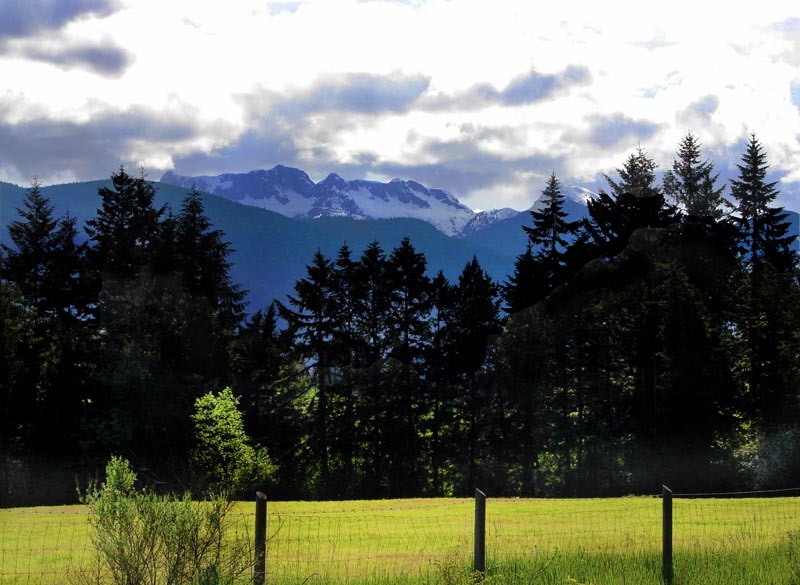 On the West side you can see it from Port Alberni and beyond– even if you don’t know its name, you can feel its presence. And conversely, on a clear day, if you make the short but strenuous hike up to ‘the Saddle’, the flat ridge below the actual peaks of Mt. Arrowsmith and Mt. Cokely, that view brings new meaning to the term ‘breathtaking’. It’s that good! 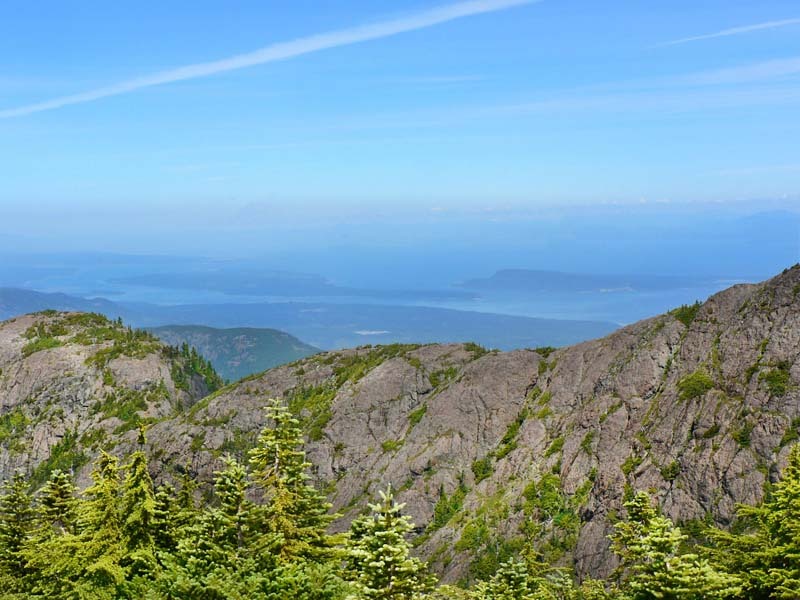 On a good day, standing at the Saddle facing East, you can see the 50 miles across the Salish Sea– all the way to the highrises at UBC and Vancouver’s West End. Turn around to the West and you can see Port Alberni and the start of the 40 mile long fjord that continues out to the wild open Pacific and Bamfield and Ucluelet. As soon as the annual mammoth snow pack (usually between 15 and 20 feet) melts off it’s rocky hide (typically early to mid summer), all that’s required to get up near the top of Mt. Arrowsmith is to be in good enough shape to hike uphill for an hour or so (it’s about a mile and a half), a vehicle capable for a half hour of bumpy gravel logging roads, sturdy shoes or hiking boots and the mandatory ‘Boy Scout’ stuff (water, lunch, bug spray, compass/gps, extra layers in case the weather changes quickly, and hikers first aid kit). 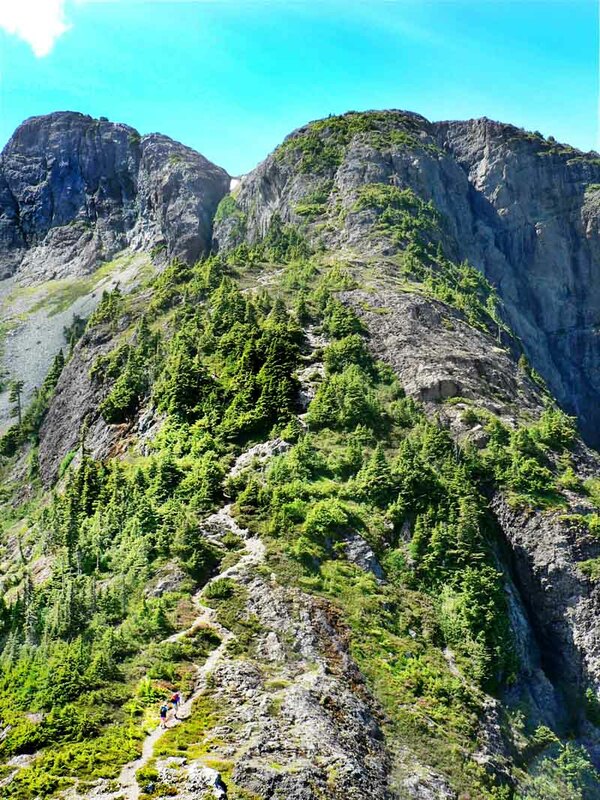 More serious hikers/climbers will continue past the Saddle to ascend to the actual peaks of Mt. Arrowsmith, but that’s a trip best left to the more experienced and prepared. My son, Patrick, our dog, Ben and I were wandering around the Saddle in between the mountain summits above us, drinking in the view in both directions when I saw this lady doing likewise. In conversation with her I found out she’d just arrived to her new life and job as newspaper editor in Port Alberni, seen in the background along with the famous Alberni Inlet. She was pretty happy to be a new resident in this Island paradise! Mt. Arrowsmith is always looking over your shoulder like a big brother in these parts, it’s rugged features providing a calming presence as you go about your business. And for those who’ve been up its slopes, whenever you glance up at it from the lowlands below, you can’t help but be momentarily transported to the memories of your time spent up there. The views start immediately when you leave your car. The first time I saw the little pull off parking area, it was 40 years ago. A few high school buddies and I bushwacked and stumbled our way up the hillside from Cathedral Grove, that famous ancient towering old growth forest below Mt. Arrowsmith, where we’d started 3 hours earlier. We only had a vague sense of where we were going, following creeks and good fortune. The grins that grew on our faces upon finding out we were on the right track when we came out on the road and parking area, was quickly tempered by realizing we could have driven our car to this point– but such are adventures in high school. The lower stretches of the hour long hike up to the Saddle are in dense forest, so that when you reach the edge of the treeline and come out into the open, the contrast is dramatic. 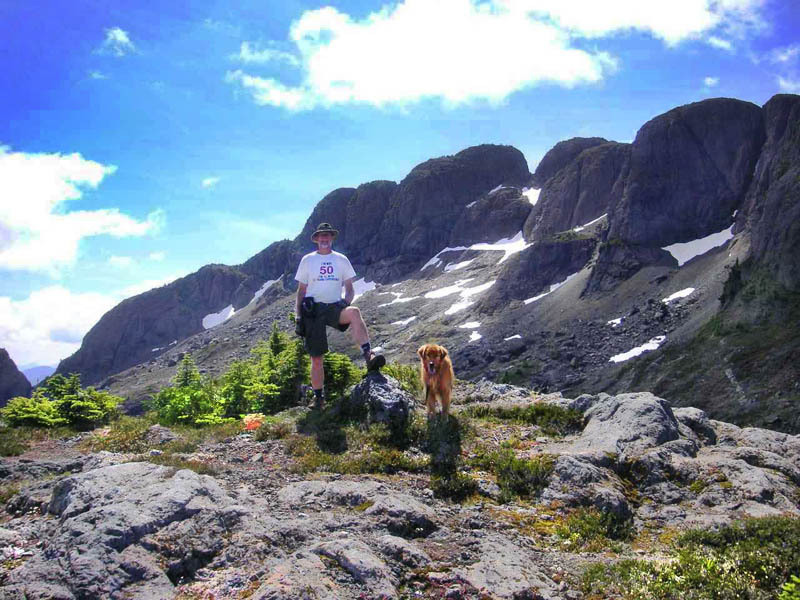 I love hiking with Ben – this is a younger version when this was taken. There’s several little ponds on the route and when you finally stand on the far side of the Saddle on the other side, there’s a lovely lake below. 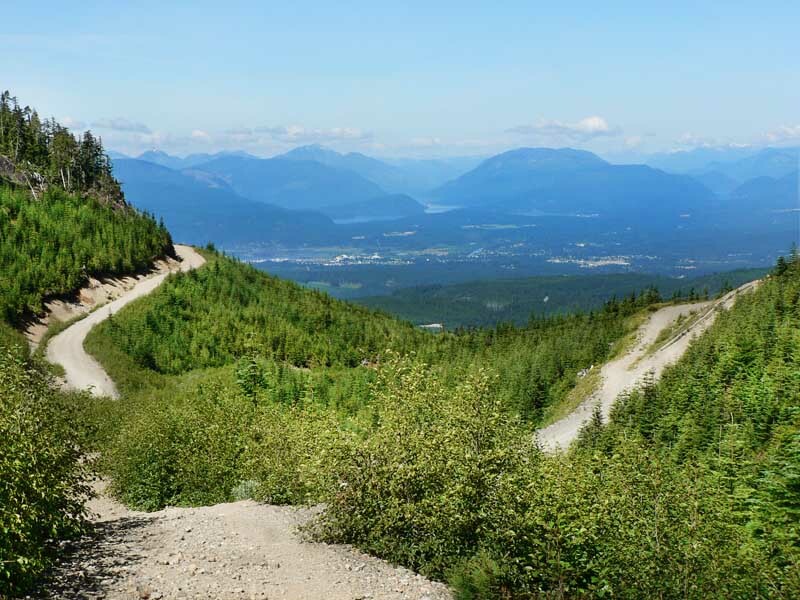 The trail levels out as you approach the area between the peaks known as the Saddle, and a glance over your shoulder rewards you with a view to the West of Port Alberni and the start of the Alberni Inlet. That 40 mile fjord is known as being one of the best places to catch salmon in the world. You can see the logging road where we parked far below. This view from the Saddle shows the many peaks of Mt. Arrowsmith. 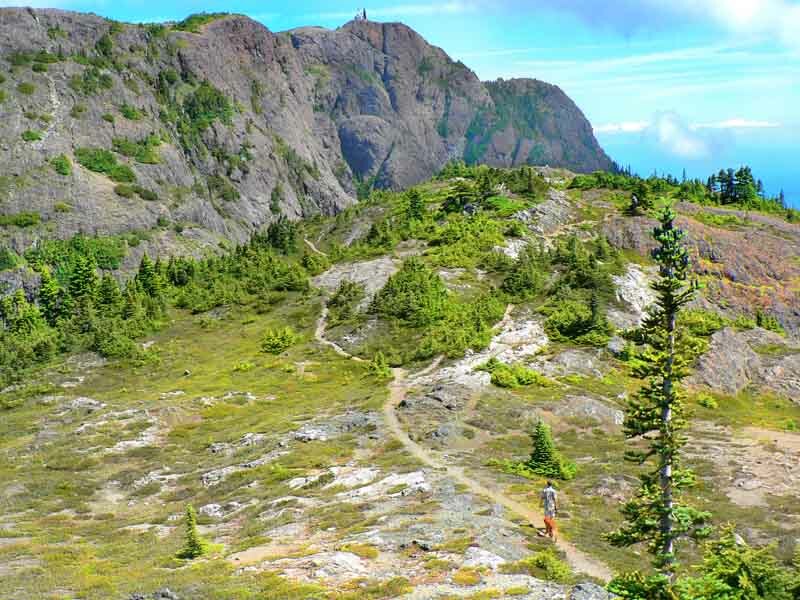 Unless you have climbing gear and rock scrambling experience, the 15 minute hike across the Saddle ridge to the start of the steep ascent is as far as you can go. The panorama from here is just too expansive for a single camera shot- several pics have to be stitched together to get a fit even most of it in. On the East side, beyond and below this picture, is a picture postcard mountain lake- you’ll have to see it for yourself- I forgot to get a picture of it! When I first came up 40 years ago, there was the fuselage of an old DC-3 aircraft, leftover from a crash in the WWII era, just above the lake. It’s since been salvaged and removed, thankfully. Turning to the North provides an ocean view over Qualicum, with Denman and Hornby Islands in the foreground and the Mainland mountains in the far distance. The ridge of Mt. Cokely carves up the foreground. After we went as far as we dared up toward the peaks — ok– as far as I dared (Patrick has since taken up rock climbing and climbs regularly in Brisbane, Australia, where he lives these days, and Ben’s mostly happy to just go wherever we’re going), we headed back to the Saddle to relax, eat some lunch and prepare to descend. Mt. Cokely’s peak and weather station gear is seen in the background, with the mainland just visible beyond, some 50 miles away. I’d just turned 50 when son Patrick took this of Ben and I. Two years earlier, I’d had a serious heart attack (as though there’s ‘not serious’ ones?!!). At that time I had no idea I’d ever be able to return to a normal life, much less be able to do this hike. To have the opportunity to feast on this incredible beauty, and share it with my son and Ben, made for a very special day for me, one I will never forget. Afterwards, we joined the rest of the family in Port Alberni to celebrate my father in law’s 85th birthday. So glad to be alive on Vancouver Island! 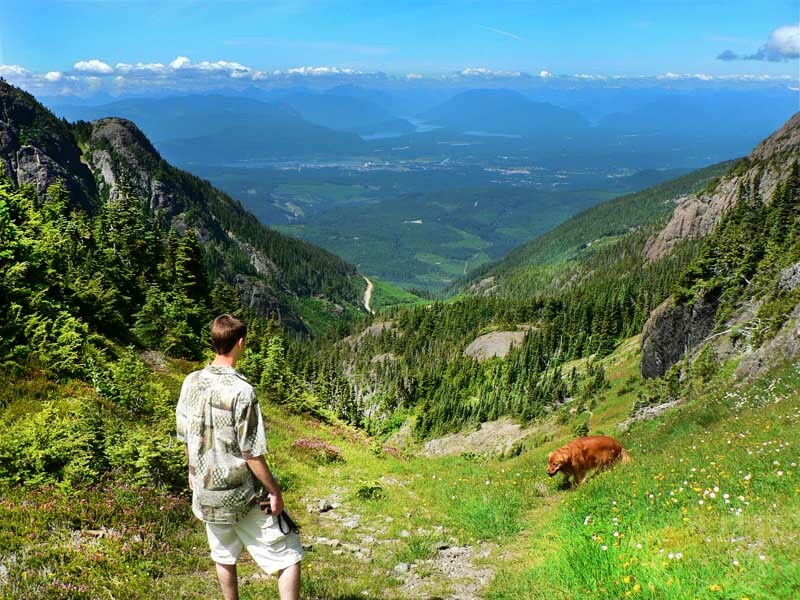 Best view on Vancouver Island? You’ll have to hike it yourself to know, but if it’s not, you can see it from here, I’m sure. Posted in: Nanaimo area parks and walks. Hiding in plain sight sums up this ‘hidden’ gem of a park. It can be seen from all over the City of Nanaimo, but it’s location is mostly known for the BC Ferries Duke Point terminal which it adjoins, and you have to turn off the 4 lane ferry highway a mile or so before the park to access the park’s neat little parking lot. Hop out of your vehicle and walk through a short pedestrian tunnel under the highway and you pop out in another world only meters from the highway hidden behind a great hedge. It’s a wee bit like the magical and muggle worlds in Harry Potter, and anytime I’ve been there it hasn’t been crowded- just a beautiful stroll along a rather exceptional peninsula. Without Ben, our retriever, we probably wouldn’t have explored half of the great walks on the Island. He loves all creatures, 2 and 4 legged- but prefers to get on with it rather than read the typically excellent City of Nanaimo trail signage showing maps, and some history of each park. The waters across the Nanaimo River Estuary, to the City and harbour can be tranquil or rough along this exposed rocky peninsula depending on wind. This is a high tide shown here, but great mud flats below the estuary can be seen at low tides which can fluctuate over 5 meters. Anyone who spends time near the ocean on the East coast of Vancouver Island is familiar with the sandstone cliffs that line many West facing shores. Startling shapes below the high tide line have been created where the sea has selectively eroded the stone, along with the impact of air temperature changes on rock of different densities. I don’t know the history of this evocative life sized First Nations carving, but it is a stunning reminder of this region’s connection to its first people. It greets you as you step onto the first of several cedar staircases that make the hike’s handful of small elevation changes easy. The round trip distance to the point and back to the car is about 3 miles or 5 km. A number of benches have been placed for rest or reflection with postcard views. This is my favourite spot on the trail, at least at high tide, when the little bay on the right is full of water. In addition to the usual conifers you see in our parks, this park also has the more rare and diminutive Garry Oaks (behind Ben), as well as Arbutus. And the bleached driftwood (escapees from water transport) is an ongoing reminder of the forest industry which continues to be a big part of our Island economy. Forestry can be more than a little tough on the ecology of the region, but think of the jobs it creates for folks who patch up boats and motors after a boater hits one of these logs when they’re still floating free in the ocean. These two sailboats are a part of a small racing fleet that had just rounded a marker and were launching their big spinnakers for the downwind leg of the Nanaimo Yacht Club’s weekly race. There were quite a number of freighters anchored off Nanaimo harbour for a while when we were taking this walk. They were using our harbour as a ‘cheap’ parking lot while awaiting a spot to load or unload their burdens in nearby Vancouver (50 km), where anchoring fees are waaaaay higher. While some of the trail is flat and smooth, the section out near Jack Point (named after Jack Dolholt who lived on the point for 40 years) has many exposed roots and bedrock protruding into the trail. Good footware is never a stupid idea! The BC Ferries loading ramp is just visible between the trees on the left. I’m sure Jack Dolholt had endless opportunities to watch (help?) as boats got into trouble rounding Jack Point- the small light above Ben’s head in the picture sits atop a large reef just off the point and plenty of boaters have met with grief trying to cut too close to shore rounding the point and found out who wins the fight between rock and hull. Great viewing bench on the trail here with a wide view from Nanaimo to the West, the mainland straight ahead, and the impressive cormorant nesting cliffs of Gabriola Island to the East. One day I’ll be less useless when it comes to naming some of the cool plants I’ve become used to seeing on Vancouver Island hikes. Like this close up of these succulents that are found near the shore mixed among the moss and rocks. Whatever they are, I like them a lot. Not exactly a skyline filled with highrises (and most Nanaimoites like it that way), it’s a great view of downtown Nanaimo from Jack Point. When a good Nor’wester is blowing this can be a pretty exciting place to be. Families and the ocean go together remarkably well I’ve found. Not exactly like the Coney Island boardwalk, but it sure makes some parts of the park more accessible. And back near the trail head, it’s amazing how that big hedge preserves the sense that you have the whole world to yourself, and keeps the visuals of the highway away from the park. Straight across from this spot on the other side of the estuary is Living Forest Oceanside Campground & RV. This is the region’s newest park, a 56 hectare (138 acre) jewel. Nanaimo River has many faces- waterfalls and raging canyons and also gentle but noisy sections like this, with quiet and clear side pools. These flat rocks heat up in the summer making a perfect place to sun then cool off in the shallow pools. The 2 km groomed trail that runs through park along the river can be accessed from either end. There’s several Geocaches too! The trails are well groomed and any elevation change is very gradual – a short way along, the trail is sandwiched between the river and some of the hobby farm grounds in the area. I saw lots of small salmon fry in this quiet side pool- and my buddy Ben gets pretty stoked when he gets near the water! The sound of the water racing over the river rocks permeates the whole park walk. There’s a reason Disneyland makes sure you can hear running water everywhere in their theme park. Even back in the 60’s old Walt knew how soothing and relaxing that sound is. Nanaimo gets it’s water supply from the pristine Nanaimo River which goes through a series of lakes before it heads down to the ocean. That’s what makes the water so much warmer for summer swimming than most of the rivers that come straight off the mountain snowpack. I’ll have to wait until next summer to come back to swim here, but I’m sure these big flat hot rocks probably call out loud and clear to folks looking to soak up some rays. Having the clear shallow pools right beside the rocks makes it just about perfect. The upper end of the 2 km trail brings you to the other trail head, a couple kilometers downstream from WildPlay Elements Park (Bungy Jump). You have to scramble down a short steep bank to access the water here where the river exhibits a very quiet section. Sadly, at this end of the park you can hear the Trans Canada highway in the distance. Back near the Thatcher Road trail head, where we started, it looks like a decent place to launch a river kayak or tough aluminum canoe as we plan to do soon, when the salmon run begins- nothing beats paddling with thousands of fish! The river rocks here make the footing a bit treacherous- this is a definitely a place for sure footed ‘wet shoes’. This is just a short video clip for folks thinking of paddling, showing the nature of the water flow in late September, when levels are low. You wouldn’t want to take a delicate craft down here- there will be some bottom bumping in some of these sections for sure, and probably a few ‘get out and walk’ places between the deeper sections. 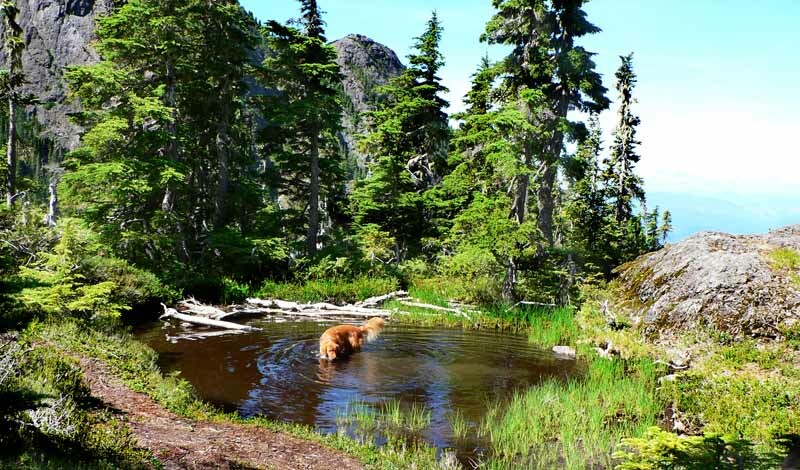 I’ll leave you with a picture of the happiest dog in Canada- at least when he’s wading around in the water. When my family moved to Nanaimo a long long time ago, we canoed from this spot down the ocean, where we now operate Living Forest Oceanside Campground & RV. I couldn’t be happier to see this little piece of heaven officially turned into a park. Hope you get to enjoy it soon! 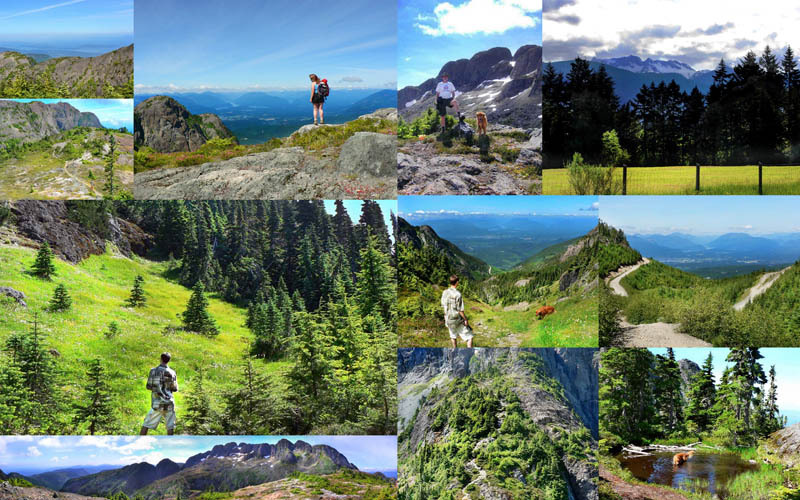 Linley Valley- Miles of forested wilderness trails right in the City! Arbutus Bluffs is one of many mossy rock outcrops poking skyward out of Linley Valley, and one of the few where you can see down into Departure Bay and downtown Nanaimo and Living Forest beyond. Because Linley Valley is surrounded by residential areas, there are many access points, some formal park entrances and others nondescript trails meandering into the forest. Linley Valley is much larger than the part that is park and adjoining timber license property (with development moratorium). This map shows approximate boundaries of those two areas and driving directions to Living Forest Oceanside Campground & RV. Shallow Cottle Lake is home to many types of waterfowl and beavers. The City of Nanaimo park trail head on Rock City Road leads down the lake. It outflows into Cottle Creek which cuts through the lower valley. A friend of mine calls Linley Valley’s primary colour as “heartbreakingly green”. That term isn’t from Shakespeare, but it is evocative. Banana slugs are called the vacuum cleaners of the forest, and contribute greatly to the complex ecosystem. My ‘cheddar’ retriever, Ben, always tries not to step on them- actually he could care less, it’s just that the slug slime messes up his fur. The miles of trails criss-cross the valley and the hilltops, and the valley trails naturally can be wet so volunteers have built boardwalks in some sections. Atop one of the ridges there are a number of cairns, some with inscriptions. The mountain in the background is Nanaimo’s Mt. Benson, and like Linley Valley, became parkland through the tireless fundraising efforts of Nanaimo Area Land Trust. Living Forest Oceanside Campground & RV has been a proud and generous contributor to NALT. A big part of the magic of Linley Valley is that people have just followed the game trails and co-opted them for themselves. A good sense of direction or GPS are needed if you’re on a time budget in the valley! 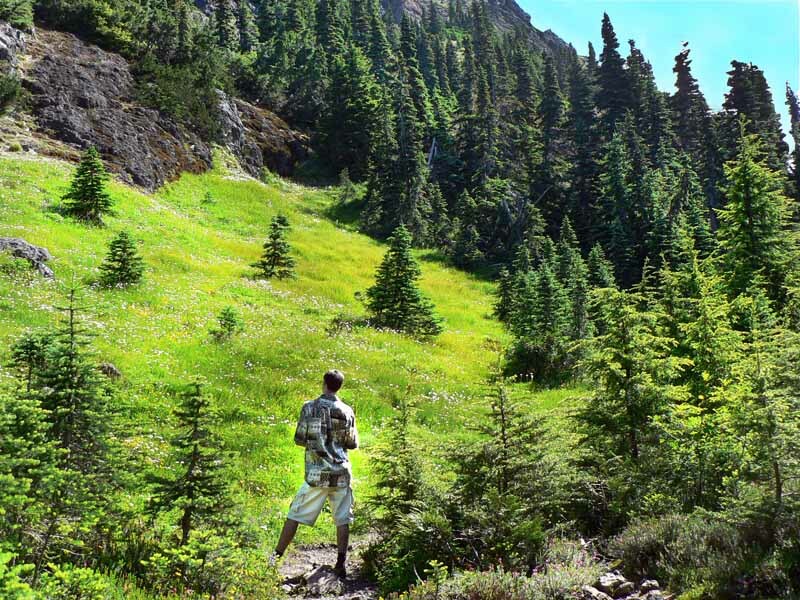 With hundreds of acres of trails, you can walk the valley every day and do hikes of widely ranging length, elevation change and difficulty. I love how one minute you’re deep in the forest and the next out on an open mossy hillside. Pileated Woodpeckers and many species of owls patrol the forest. Seems like awfully hard work to be rewarded with bugs. My wife calls the City Parks staff groomed trail system “the good walk”, as it has smoother surfaces, proper bridges and signage. Ben doesn’t really care as long as he’s in the valley somewhere. Seeing the different views as the seasons change always makes me wonder what the view will be like on a given day. Because the valley is ringed with rocky ridges, you rarely hear the City even though you’re right in the ‘donut hole’ between the Departure Bay and Hammond Bay residential areas. Since my Blackberry Torch smartphone has GPS, I downloaded Geocaching software (about $10), and have had lots of fun searching for the many geocaches in Linley Valley. Ben gets really excited when we close in on our target- I don’t think he really understands the game, but he thinks he does. There’s something quite wonderful and renewing to walk through a forest trail. This is a much younger Ben and seeing this shot reminds me how many years we’ve explored Linley Valley together.